When nature lovers talk about the Irrawaddy River, the lifeblood of Burma, descriptions focus on her majestic beauty, breathtaking scenery as well as the unique history and culture born over the centuries. However, these days it is the tale of the admirable Irrawaddy dolphins, named after the waterway, which captures the imagination most of all. These graceful swimmers are closely related to the orca (killer whale) with a large, rounded forehead and snub beak. Their gray bodies darken towards slate blue while their abdomens remain a slightly paler shade. They are commonly seen in groups fewer than six, occasionally emerging for low leaps above the surface but never riding around the bow of passing vessels like their ocean-dwelling cousins. Unlike dolphins from other Southeast Asian countries—such as Laos, Cambodia, Indonesia, the Philippines, Thailand, Bangladesh and India—the Irrawaddy variety of Burma is famous for helping local fishermen. "When the fishermen trace the dolphins, they tap on the side of their small boats with a wooden staff to make a rhythmic call. Later, they softly rustle the water with the oar, winding clockwise and anti-clockwise, and frequently combining this sound with the staff. However, this signaling method is not a sure-fire way of persuading dolphins to lend their assistance. “There are times when we return without any sign of them. Sometimes only one is seen, but sometimes two or three dolphins are spotted,” he said. 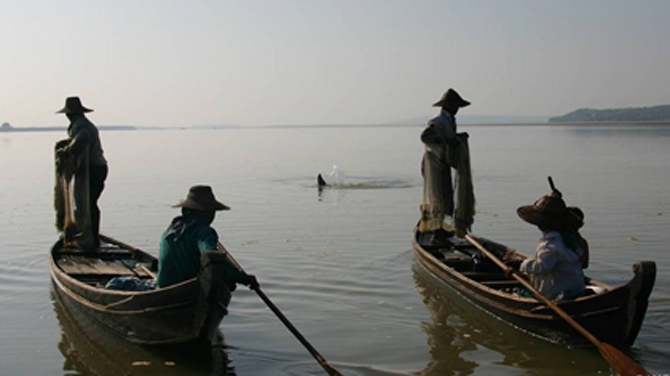 After a while, two Irrawaddy dolphins arrive in the distance to assess the situation. Before too long, they swim to-and-fro in a semi-circle, herding a school of fish toward the boat. Increasingly intense splashing from their prey can be seen as the herd is forced into a tighter group. As the circle decreases, one of the dolphin lingers outside to act as a sentry in case any individual attempts to flee the school. Meanwhile, the fishermen prepare to cast their nets while waiting for a “fluke wave”—a dolphin waggling its tail fins back and forth above the water—to indicate they have herded enough fish to catch. The fishermen give a tapping sound to signal that they are ready to throw the net, and the dolphins make a quick final push of the school toward the boat. As soon as the fisherman throws the net the dolphins rush out of area to prevent getting trapped inside themselves. As the teeming catch is hauled on board, the dolphins move back toward the boat and wait on the surface for their quota to be thrown by the fishermen. Sometimes, they also hoover up escapees from the net. After all the catch has been securely stored, a fisherman taps the side of the boat again and the dolphins swim closer like they are awaiting orders. When the fisherman slaps the water with his oar, telling his aquatic colleagues to be ready for a second cast, the dolphins make a guttural sound from their throat to show they understand, and break off from each other to start the whole routine once again. According to local fishermen, working with the dolphins can triple their catch compared with laboring on their own. And this traditional understanding between man and beast has been handed over from generation to generation of Irrawaddy fishermen. The area between the Kyauk Myaung and Mingun sections of the Irrawaddy River, in Mandalay Division, measures around 230 miles (370 km) of freshwater where Irrawaddy dolphins can be found, and has been established as a protection zone for the creatures since 2005. According to the New York-based Wildlife Conservation Society (WCS)—which jointly works with Burma’s Department of Fisheries for the preservation of Irrawaddy dolphins—the population found around Kyauk Myaung has increased to 86, including many calves. There were only 37 found along the river in 2003, which increased to 72 by late 2008. Existence of marine life as Irrawaddy Dolphin will give an attraction to Tourists and can boot the related business. It can benefit for peoples living there and improve their livelihood. We need to educate people to protect nature and environment. Wishing for long living Irrawaddy… long living Dolphin & Marine lives….prosperity of people. Thank you very much for a wonderful and comprehensive story of lovely Irrawaddy dolphins. Since I have learned about the marine mammals in Irrawaddy about two decades ago, I always wanted to know more about them who help fishermen catch fish. I hope not only Burmese Irrawaddy dolphins but also Burmese people are the most cooperative people who always offer helping hands to fellow citizens. But it's disturbing that this site hosts an ad for captive dolphins along with this article. Dolphin captivity is inhumane and is quite opposite to the spirit of cooperation portrayed in this article. beautiful ! Hope they survive.